Ralph Northam, the Democratic governor of Virginia who is currently embroiled in a scandal involving blackface, Ku Klux Klan robes and a Michael Jackson impersonation, has learned from the other side of the aisle. So far he’s adamantly refused to resign, despite his own party basically telling him he has to. It’s the kind of brazen me-first ploy you expect from a Republican party that has long tolerated Steve King and elected Donald Trump president. If you missed the news over the last few days, here goes: late in the week it was revealed that Northam’s medical school yearbook page from 1984 included a photograph of one man in blackface and another in Klan robes. Yes, in 1984. Initially Northam put out a statement verifying that the yearbook page was real, where he assumed that one of the two men was him. But then, in a press conference on Saturday morning, Northam denied that he was in that photo, while also revealing that he did wear blackface in college while doing a Michael Jackson impersonation. So his defense against blackface and Klan charges is that he actually did blackface at a different time while in college in the mid ‘80s. This dude did blackface the year Ghostbusters came out. The year Who’s the Boss premiered. The year “When Doves Cry” and “What’s Love Got to Do With It” topped the charts. Northam tried to absolve himself from blackface charges by copping to another bout of blackface that still happened decades after blackface and minstrelsy had disappeared as a form of mass entertainment. Even if he isn’t racist (which, I mean, he pretty much has to be, or at least was in his mid 20s in 1984), at the very least he’d be the stupidest man in politics this side of the president. It’s such an unbelievable and all-around embarrassing situation that of course it’s inspired some pretty great tweets. Here are the funniest responses to Northam’s racism and bumbling reaction. 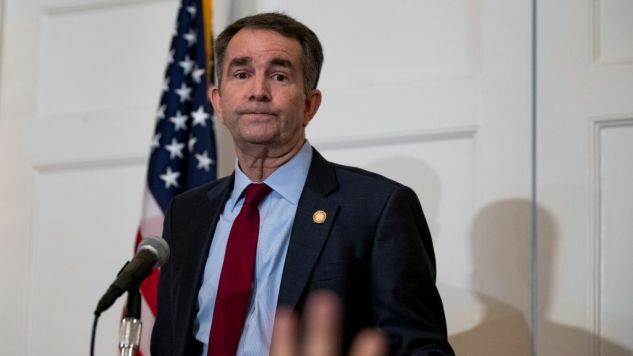 FOR IMMEDIATE RELEASETomorrow morning Governor Northam will be announcing whether he was the one in blackface or the one in the Klan outfit – until then, have fun guessing! Northam: I’ll say it wasn’t me. Press Secretary: GoodNortham: And—Press Secretary: For the last time—Northam: Everybody knows a racist can’t love Michael Jackson! Press Secretary: Absolutely not!Northam: Fine.Press Secretary: Thank you. Northam: ...I did it black face. Demanding Ralph Northam’s resignation would rob Virginians of the opportunity to witness what could go down in history as one of the most mediocre, caretaker governorships of all time. Wow, Northam is now saying there’s a second photo, taken moments later, where he’s tackling the guys in blackface and a klan robe. Ralph Northam should release his calendar from 1984 where he never wrote down his plan to wear blackface that day so it must not have happened. That’s wild when you cop to some black face people didn’t even know about to prove you didn’t do the black face people know about. At this point, the only people defending Ralph Northam are people who know they also have very racist yearbook photos to worry about. So Northam wasn’t the one in blackface in that picture. He was in blackface in a different picture and the yearbook staff got confused. Y’all really can’t tell us apart even when it’s still y’all. It’s been a while since I’ve watched it, but I’m 90% certain that a guy going on national tv and explaining that he knows a picture of a man in blackface isn’t him because the time he wore blackface he was dressed as Michael Jackson is an Arrested Development plot. Tomi Lahren- I am horrible!Howard Schultz- Hold my coffee!Ralph Northam- moonwalking Hold my shoe polish!Ann Coulter- Hold my beer!Brett Kavanaugh- I LOVE BEER! I LOVE BEER starts crying and calendars. Anyone in Vegas who took the over on GOVERNORS MOONWALKING AWAY FROM THEIR OWN RESIGNATION this Super Bowl weekend is on the verge of cleaning up HUGE.